What a week! Reed left (after finishing his finals-woo hoo!) for California on Tuesday for the MPSF quarterfinals against CSUN. 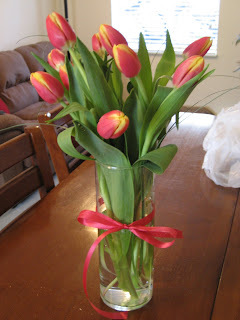 He was so awesome to leave tulips and a graduation shirt for me when I got home that night. My parents got in town on Wednesday for all the graduation fun. One problem...they bought a painting at the BYU Bookstore before they realized that it wouldn't really fit in their car for the drive back to California! But Dad is an excellent packer, and made it work. Thursday was the big commencement ceremony (I'll post some pictures later when I get them). I was not so excited to go and did everything I could to get out of it. But nothing worked. It was cool to hear our speaker, Elder Bednar speak. I just wish I would've been able to stay awake for the whole thing! Thursday night we had Reed's mom, little sister, and older brother and his family all came over to watch the CSUN game on my computer (only available on the internet). We had a lot of fun together and the Cougs swept the Matadors to advance on to the MPSF Conference Championships! Way to go! Friday was the smaller individual college ceremonies. I didn't care much for the strange musical number or depressing speech (she basically told us that just because we graduated that it doesn't mean we have an education), but they did say my name right! My parents had to leave Friday so Ryne and Trae wouldn't be at home alone for too long. It was great to have them out here and I'm thankful for the sacrifices they made to do so. Saturday Reed's mom took us to breakfast at Kneaders-soooo good! I forgot how incredible that place is! Then we went to the dinosaur museum in Lehi. The kids loved looking at the dinosaur bones! Then we headed back for some lunch and for Marie to use up the rest of her meal plan before she left for the summer. 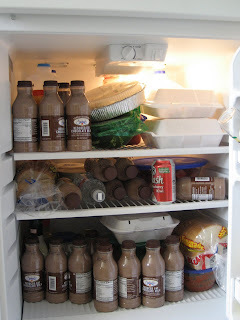 So we pretty much have like 25 bottles of BYU chocolate milk in our fridge! That is good stuff! We ordered pizza, drank chocolate milk, and watched the championship game against Pepperdine on my computer. We won the first 2 games, but lost the last 3. BYU lost it's chance at an automatic bid to the Final Four, but was hoping for an at-large bid. Unfortunately, they were cheated out of that and LBSU got it. So that's it. Our volleyball season is over. We're bummed, but we're also excited to have some weekends again. Now we're just waiting to see when Reed gets to come home...hopefully soon! It's been a hard week to have him gone. But I'm so proud of how well he has done this season. He has worked very hard and has had to put up with a lot of stuff with the coaches, but has always kept a good attitude (he has certianly handled it much better than his crazy wife!). I love you Reed and hurry home! The last 2 weeks have been so fun for us because we've gotten to see so much of our families! Last weekend, we had my sister and her husband, Reed's older brother Jay and his family, and Reed's parents (for a few hours!). They were all able to come to the last 2 regular season home matches against USC. Unfortunately, they didn't get to see Reed play much (mostly because it was senior night). But we had so much fun with them-especially when building a volleyball net in our kitchen! This weekend my parents and my little brother Bryant stayed with us Friday night before heading up to BYU-I. Unfortunately, Reed had a calc final Friday night from 7-10 and a statics final Saturday morning from 7-10. But it was still good to have them here. 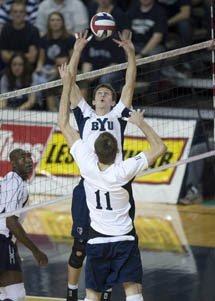 Saturday night Reed's parents were here for the quarterfinal game of the MPSF tournament when BYU hosted UC Irvine. I won't get into it to much because it just makes us all mad, but Reed didn't get to play. The coach pretty much made the worst decision ever and started the 3rd string setter that hasn't played all season in our first post season game. The Cougs took the first 2 games easily, but blew it at the end of the 3rd game. Finally after struggling much of the 4th game, Coach Patchell put the senior setter in and he finished off the Anteaters (pretty intimidating, huh?). It was the most disappointing win! We were all pretty upset that Reed and Brian have put in so much work this season to just get brushed off at the end like this. Hopefully next week will be better. In other exciting news, I'm pulling out all my Tupperware and favorite casserole recipes because I was just called and the Compassionate Service Leader in our ward! I'm actually really excited for this calling and can't wait to start making meals for all the new moms in our ward! This week Reed will be finishing up finals, going to California to play CSU Northridge in the semi-finals and hopefully playing in the conference championship, I'll be walking in graduation and enjoying all the family coming to town this week! 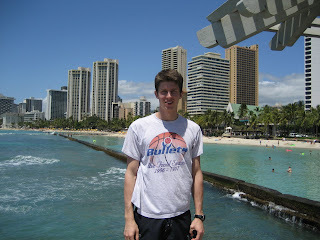 This was the week BYU played at Hawaii and Reed had a pretty good trip. He got to play Thursday night and they won, but didn't play on Friday because he was feeling sick (but they still somehow won without him). I got to enjoy listening to the games on internet radio from 11-2ish because of the time difference. They flew out Tuesday morning and got back Sunday morning. It was a long, tiring trip. Reed has slept pretty much all day! 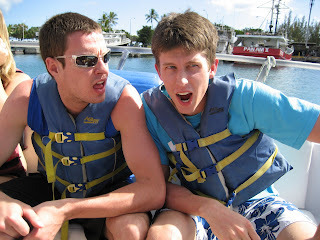 Somehow the plane tickets "got messed up" and they had a whole extra day in Hawaii to do whatever they wanted! So Reed and a few of the other guys went snorkeling and parasailing! They got to see some cool tropical fish and got a little sun while doing it. He really enjoyed the parasailing and said their boat driver even dipped them in the water for a minute. 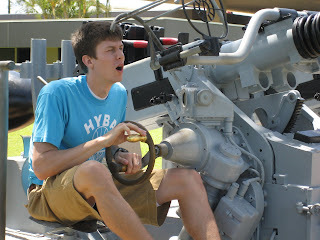 He also got the chance to go to Pearl Harbor during the week. They really liked it and wanted to spend more time there, but had to get back for practice. This weekend was also an awesome General Conference. Unfortunately, Reed didn't get to see any of the Saturday sessions. I personally loved the Solemn Assembly. It was so neat to see the General Authorities stand and sustain each other and then to get to do it myself. We are so thankful for President Monson and all our other leaders and for the unwavering structure of the Church.